Showers and thunderstorms associated with an area of disturbed weather about 500 miles east-northeast of the northern Leeward Islands had become less organized since Thursday because of strong upper-level winds, and satellite data suggested that the surface circulation has become less defined. Environmental conditions were expected to be only marginally favorable for development over the weekend while this system moved west-northwestward at about 20 mph, and the chances for tropical cyclone formation appear to be decreasing. 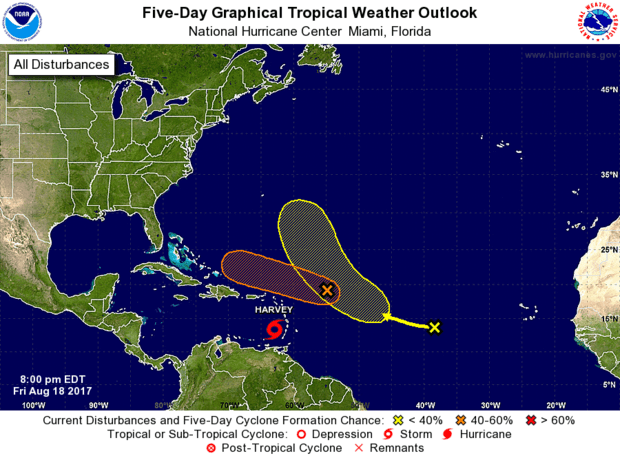 Formation chance was placed at 50 percent over the next 48 hours to five days. A tropical wave over the far eastern Atlantic, almost a thousand miles west of the Cabo Verde Islands, was producing limited showers and thunderstorms. Conditions were somewhat favorable for gradual development over the next few days while the system moved west-northwestward to northwestward at about 20 mph, but upper-level winds were forecast to become unfavorable by the middle of next week. Tropical formation chances were 10 percent over the next 48 hours and 30 percent over the next five days. The Hurricane Center said Friday evening that Tropical Storm Harvey will move through the eastern Caribbean Friday night and through the central Caribbean Sea Saturday and Saturday night. Locally heavy rains could occur Friday night over portions of the Windward Islands and the offshore islands of northern Venezuela. Locally heavy rains could also occur over Aruba, Bonaire, and Curacao on Saturday.